Yesterday was one of our seared dates. I was a successful normal person yesterday instead of an evolved therapist. I busied my way through the day keeping my mind off the date that will never leave me. Sure, I got a lot done and the things I got done bring nothing but honor to our never to be babies but I also know I must allow the sadness, grief and forever longing to be. Because only through the darkness do we make room for the light. And so, with my scarred but never closed soul I wonder who they would have been, I grieve the lifelong losses with both sadness and anger at how unfair it sometimes feels and I trust I am making them proud by how I parent them from afar and always choose to rise ever upward. In case you missed the announcement on my social media (Instagram, Facebook or Twitter) and in the September Newsletter Preview (make sure you subscribe here), one of those things that kept me busy yesterday was my newest project! My first adult coloring book, Taking Flight! 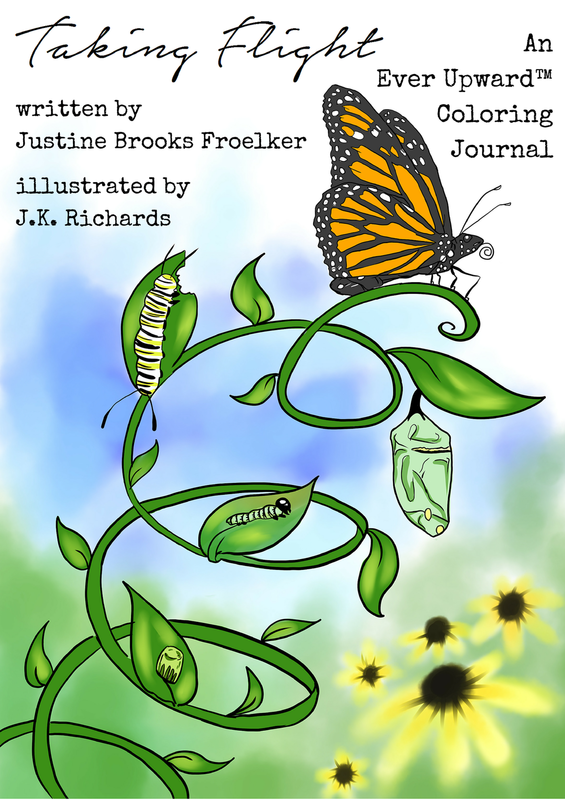 Taking Flight is an adult coloring book containing coloring pages and journaling prompts, guiding the reader through the miraculous life cycle of the monarch butterfly while leading the reader to draw parallels to their own life journey and struggles.